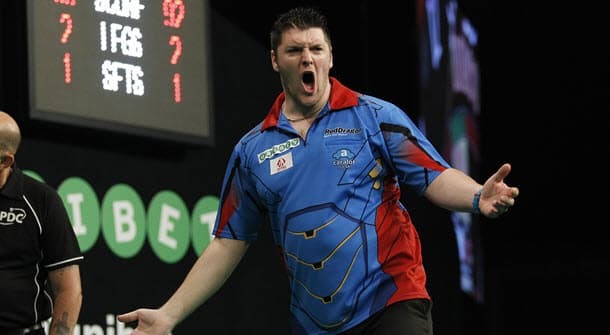 Daryl Gurney at 7/2 4.50 +350 3.50 3.50 -0.29 is a stonking bet to make the semi-finals of the 2019 Unibet Premier League Darts. The PDC/Sky Sports spectacular returns for its 15th edition on Thursday night 7th February. The late withdrawal of Gary Anderson has sadly reduced the competition to 9 players. They will battle it out over 16 nights in the hunt for a place in the final four. Then we all head to the O2 in London for the semi-finals and final. In the first nine weeks, the nine players play a round-robin competition. Everyone plays each opponent once. All games are best of 12 legs with 2 points for a win and 1 point for a draw. After Week 9 (Judgement Night) the player in last place will be eliminated. The remaining eight players play each other a second time with points gained in the first phase carrying forward. After this round of games the top 4 in the league head to Finals Night in London with #1 v #4 and #2 v #3 for a place in the final. With £250K for the winner and £50K for the 8th place finisher it’s, it’s a hugely rewarding event. However, the long 4-month structure doesn’t suit all players. Thursday night trips all over the UK and further afield to Dublin, Rotterdam and Berlin can take their toll. Hopefully this will enable us to thin the field and find some punting opportunities. It’s a shame Gary Anderson misses out as he was very opposable this year because of his fitness doubts. Crowned world champion for the 3rd time at the Alexandra Palace on New Years Day, MVG is a standing dish in Premier League Darts. He has won the round-robin phase 6 years in a row and the competition itself 4 times. Quotes of 1.22 to win the league phase tell their own story. He does tend to ‘switch off’ for some games so will have a few defeats and draws along the way. It would be nice if those occurred against our selections. Prediction for league phase. First place beckons again. Bully Boy Smith had a terrific 2018 which peaked with a run to the final of the World Championship as tipped up by my colleague Eric Roberts. He looks like the main challenger to MVG and was runner up to the Dutchman in this event last year. His form at the recent BetVictor Masters in Milton Keynes was patchy, but we can expect some improvement when the Premier League starts. Quotes of less than 1/1 2.00 +100 1.00 1.00 -1.00 to reach the semi-final are not very tempting. Prediction for league phase. Semi-final place should be achieved. Burst onto the scene in the second half of 2017 and ended up romping to the World Championship. 2018 was a disappointment in comparison as he was just decent rather than spectacular. Looking to the future, it seems Cross is likely to be a solid player rather than the superstar he once threatened. He did seem to embrace the unique challenges of this event last year so has potential. Prediction for league phase. On the fringes of a semi-final place. Snakebite had a dismal time at the end of last year with early exits at the Ally Pally, Grand Slam of Darts, Players Championship and European Championship. He did show some improvement at the BetVictor Masters reaching the semi-finals. He has only appeared at Finals Night once in his five appearances in this event and that trend could continue this year. Needs to find a set of darts and stick with them. Prediction for league phase. Just missing out in 5th place. One of the most popular players on the circuit. The Austrian had a strange debut last year. He averaged over 102 in 4 of his first 5 matches yet was eliminated on Judgement Night with just 2 wins. On his day, he has the game to beat them all so expect a better showing this year. Doubts remain about how committed he is to this event and the travelling involved. Prediction for league phase. Fade away to 6th or 7th. Finished 5th on his debut last year after throwing away a few games in the first phase. Gurney ended up with an incredible 8 draws in his 16 games. He finished last year in decent form with a semi-final spot in the Grand Prix and winning the Players Championship in Minehead beating MVG in the final. Disappointingly, Gurney then exited the World Championship early. He seemed in good nick in the Masters at the weekend albeit losing in the first round to Dave Chisnall, a match he should have won. Indeed finishing matches off after a good start remains the big issue for Super Chin. He could also do with avoiding getting involved with the audience. Prediction for league phase. In the mix for a semi-final place. Has sustained an admirable career by consistently winning matches against lesser opponents. And topping it off by nicking the odd game against his superiors. Much more is needed in the Premier League however with no soft opponents. Form figures of 7,6,7 in his last 3 appearances show his level against this calibre of opposition. Prediction for league phase. Somewhere between 5th and 7th. Endured a dismal debut last year with only 2 draws in his 9 games. Took some time out to recover from injury and came back strongly to win the Grand Slam. However, it was a curious Grand Slam and Price won it without averaging above 98 in the knockout phase. 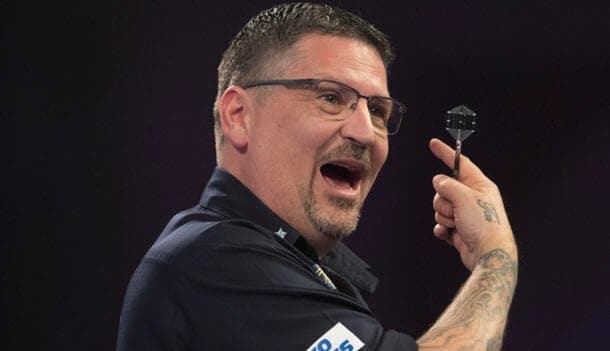 It was a win overshadowed by controversy and he was recently fined £21K for his antics against Gary Anderson in the final. The Ice Man will have to cope with the boo-boys at every venue. In truth, even his best game leaves him with a bit to find against most of this field. Prediction for league phase. A strong candidate for an early departure. A poor wild-card pick by Sky Sports. His World Ranking of 28 means he should have been overlooked, and players like Dave Chisnall and Simon Whitlock can rightly feel aggrieved. Barney brings no form and little evidence of battling qualities to the event. The absence of Gary Anderson has reduced the relegation places which gives him a chance to play the whole tournament. His opening trio of games against Wade, Price and Suljovic at least gives him a chance to hit the ground running. Prediction for league phase. Can scrape into the second phase but no further. Smith, Cross, Wright, Wade, Gurney and Suljovic appear to be in a battle for 3 semi-final places behind MVG. All have question marks against them but Daryl Gurney seems amongst the more solid of the sextet. Happily for us, he is also the largest price. Gerwyn Price and Barney are in a straight fight to avoid relegation, and the Welshman is my pick. The late absence of Gary Anderson has let to some tweaks by the PDC. Rather than the obvious solution of a direct replacement, they have called up nine different players to take his place. Each will play one game against the scheduled opponent of Anderson that week. If the regular player wins or draws then they get the points. It’s a curious and unsatisfactory way to do it. This week Chris Dobey will substitute in to play Mensur Suljovic, whilst on other weeks it will be Big John Henderson or Max Hopp. Barney has a reasonable record in Week One over the years. On the grounds that he needs to come out firing, he is a worth a small bet at 7/4 2.75 +175 1.75 1.75 -0.57 . Of more interest is Chris Dobey against Mensur Suljovic. Dobey reached the Last 16 at the Ally Pally posting a 100 average over 7 sets in defeat against Gary Anderson. Prior to that, he reached the quarter-finals of the Players Championship in Minehead with wins over Dave Chisnall and James Wade. All good recent form and he will surely relish this one-off opportunity. Mensur is in good nick as well but can blow hot and cold. Dobey for the win at 7/2 4.50 +350 3.50 3.50 -0.29 is too big to ignore.